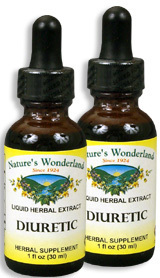 Diuretic Liquid Extract, 1 fl oz / 30 ml each (Nature's Wonderland) - Penn Herb Co. Ltd. DIURETIC herbal blend promotes fluid balance and soothes bladder & urinary discomforts. Use with Nature's Wonderland Cranberry capsules for extra cleansing and flushing action. Uva Ursi…urinary antiseptic cleanses the urinary passage. Marshmallow Root…provides exceptionally soothing comfort for delicate tissues of the urinary tract. Juniper, Nettle Leaf…increase flow of urine and supports healthy kidney function. AMOUNT PER SERVING (450mg/ml or 30 drops): Proprietary Blend Uva Ursi Leaf (ethically wild harvested), Certified Organic Nettles Leaf, Certified Organic Fresh Dandelion Root, Juniper Berries (ethically wild harvested), Certified Organic Fresh Marshmallow Root, Certified Organic Horsetail Herb, Certified Organic Fresh Ginger Root. OTHER INGREDIENTS: Grain Alcohol (39-49% by volume), Deionized Water. Free of: milk, dairy, egg, fish, shellfish, tree nuts, peanuts, wheat, gluten or soy. Supports healthy urinary function; promotes kidney health; increases the flow of urine.